Think German beer and it is likely that a pale, straw-colored German Pilsner is the first thing to pop into your mind. The casual beer drinker can be forgiven for thinking that all German brewers produce the same stuff. The German beer scene is actually more complex than many people think and the country produces a vast range of lagers and ales. As an introduction to the many beers of Germany, here are 10 examples of great beers in the most popular styles. Let’s get Pilsner out of the way first, shall we? There are many great German Pilsners available and this is the most popular style of German beer. 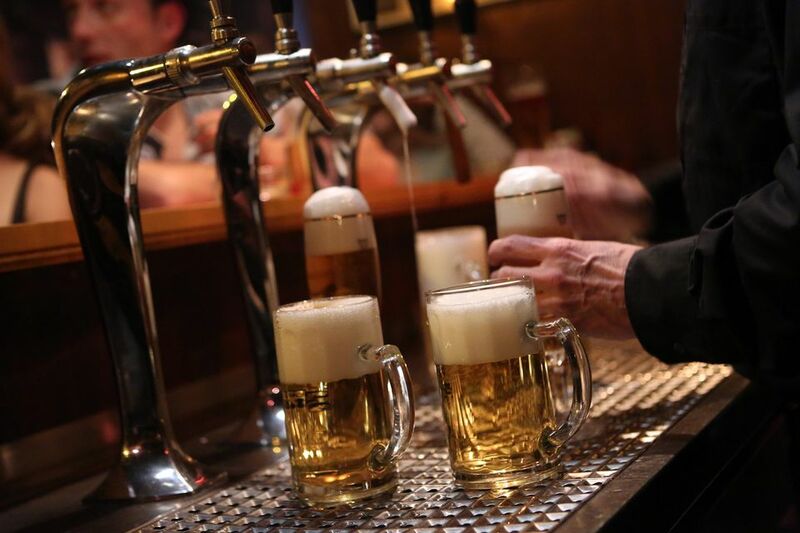 Many brewers produce wheat beers, but nobody can do it better than the Bavarians. The unique flavor and aroma of this cloudy style come from the special yeast used to ferment the blend of malted barley and wheat. Weihenstephaner has been making this marvelous stuff almost longer than anyone else and their Hefeweissbier is one of the best examples of German wheat beer. In 1872, a Spaten brewery invented this sweet, brown style in Munich, Germany. Oktoberfest, or Maerzen, is traditionally brewed in March and served in autumn, just in time for the annual festival of Oktoberfest. Spaten's Oktoberfest is only available from August until October or November. Paulaner also makes a fine Oktoberfest which is available year-round. Many brewers throughout the world have latched on to this style and many of them are also available throughout the year. Bock is a special style of German beer that has a number of sub-styles. This first block of the list is a very traditional example and one that claims to be the “first” block. Books are known for their dark, malty style and Einbecker is where the block was developed. The Einbecker brewery took its name from the German town of Einbeck where it continues to brew bock and its Ur-Bock is widely recognized as one of the best examples of the style. Doppelbocks are darker and richer than books and Paulaner’s Salvator is a fine example of this style. All bocks are lagers, so despite the big flavors, they are still crisp and clean with some sweetness. How heavy is a doppelbock? Paulaner Salvator Doppel Bock is a beer of legend, and the story goes that monks were able to fast for long periods because they drank it. Categorized as a Helles lager, Ayinger Bräu-Hell bridges the gap between light bock style of Mai bock and pilsners. It was, after all, originally developed as the Bavarian answer to Pilsner. Despite its pale color, it is still quite malty in flavor but it’s generally hoppier than other books. This classic beer is a contrast within itself and a fine example of the Helles style. Kölsch is an unusual beer because it is brewed with ale yeast, but it is aged like a lager. It is pale and refreshing with moderate hopping. Purists are groaning as they see that the choice for the Kölsch entry is actually brewed in Chicago. However, the best Kölsch style beers are brewed in Cologne and rarely make it past the German border. The few that do make it out can be hard to find. Luckily, Summertime from Goose Island is a fine example of the style and it is readily available. Good German-brewed Altbier is also hard to find outside of Germany so try this fine example from Alaskan Brewing Co.
”Alt” is subtler than you would expect from its brown or amber color. It is slightly malty with hardly any hops aroma. It is usually rather bitter, but not aggressively so. Rauchbier, or “smoke beer,” is a very unusual style. The beer itself is a lot like Oktoberfest with sweet and malty flavors, but the smoke flavoring adds a completely unexpected element to the profile. Some drinkers describe the flavor to be like beef jerky or even leather. Aecht Schlenkerla Rauchbier is worth tracking down if you’ve never tried it before. Berliner Weisse is another very unusual style of beer. The flavor and character come from deliberately soured grains that produce a tart and tangy beer. It is very refreshing, and many fans of this style like to add fruit or herb flavored syrups, but it's also great just the way it is.